Kawasaki today released an updated Versys 650, a "new to the American market" 1000cc touring version of the Versys, and a new parallel twin entry level cruiser with modern styling queues, labeled the Vulcan S.
The Kawasaki Versys® 650 ABS comes into the 2015 model year with a host of updates, including dramatic new styling, more power and torque, improved comfort as well as rubber-mounted engine and handlebar, plus new suspension to maximize your street-riding fun. The 2015 Versys 650 ABS is one of those rare motorcycles that is equally at home commuting on the local freeway or mixing it up on your favorite back road. Whatever your destination, this reliable, versatile, comfortable and nimble motorcycle will eat up the miles and encourage you to take the long way home. Two versions of the 2015 Kawasaki Versys 650 will be offered– an ABS model, with everything you’ve come to expect from this flexible motorcycle, as well as an LT model. The LT includes all the same high specification but will additionally have KQR™ (Kawasaki Quick Release) Hard Saddlebags and Hand Guards to increase its overall versatility. The 2015 Kawasaki Versys 650 ABS continues to lead the way in the street adventure segment with its proven reliability, back road ability and awesome performance. And, with the 2015 updates, Kawasaki has ensured it will continue to be the top choice as the go-to bike for riding enthusiasts needing a dependable, versatile machine at an affordable price. One of the standout attributes of the 2015 Kawasaki Versys 650 ABS is its upright riding position, which is ideal for commuting, back road runs and even weekend jaunts. Its narrow frame allows the Versys 650 ABS to be nimbler than its bulky competition. And for 2015, the comfort has been enhanced with the relocation of the footpegs. Located 15mm lower and 20mm further forward in comparison to the 2014 model, the footpegs allow the rider to enjoy this versatile motorcycle in greater comfort. The stepped seat has a tapered front and low profile, assisting riders to reach the ground. The raised passenger area is also very comfortable for extended journeys. Combined with the new footpeg location and increased wind protection, the 2015 Versys 650 ABS is a truly comfortable companion. The 2015 model also gets a new rear subframe and revised rear suspension that will allow the motorcycle to carry a larger payload. It will also make longer road trips a pleasure, thanks to a compliant ride and impressive suspension action that allows you to make the most of any road. As an added bonus, the new subframe was designed to integrate the optional KQR™ (Kawasaki Quick Release) Hard Saddlebags (these come standard on the 2015 Versys 650 LT model). The two bags, when combined with the purchase of the additional KQR 47-liter Top Case, will provide up to 103 liters of extra storage space. The One Key system allows a single key to be used for the motorcycle ignition and the saddlebags. So you can gear-up for longer journeys, wherever your paved road adventure may lead. A revised upper triple-clamp has also been added for 2015. It has a rubber-mounted handlebar, which helps to reduce vibration for the rider. The rubber collars tame vibration while new rubber pads control movement fore and aft. 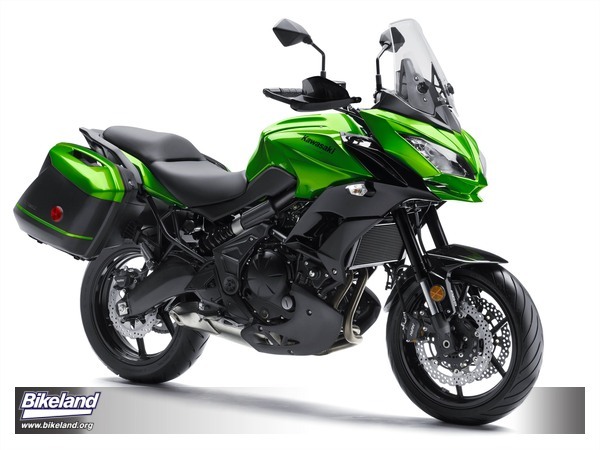 The 2015 Kawasaki Versys 650 ABS has all-new, dynamic styling that is sure to catch your eye. To sculpt the aggressive new appearance, the designers took inspiration from Kawasaki motorcycle heritage with the creation of a new front fairing, where we now find a design that is equally good-looking as it is functional. Rather than the previous stacked headlights, it has two horizontal headlights incorporated into the upper cowling. The new look exudes Kawasaki’s sportbike DNA in a uniquely Versys-specific package. Design elements include a chin spoiler under the headlights, as well as air passages on the side of the cowling. The spoiler provides downforce at higher speeds, while the passages direct air around the rider and passenger. The new cowling also incorporates a larger windshield. It is almost twice as large as last year’s model, giving increased wind protection and reduces buffeting on the rider. It can be adjusted in height by up to 2.4” (60mm) without needing any tools, and thereby suit a wide range of riders. The passenger handholds and tail section have been updated. The LED tail light incorporates an all-new design that reinforces the sporty image. 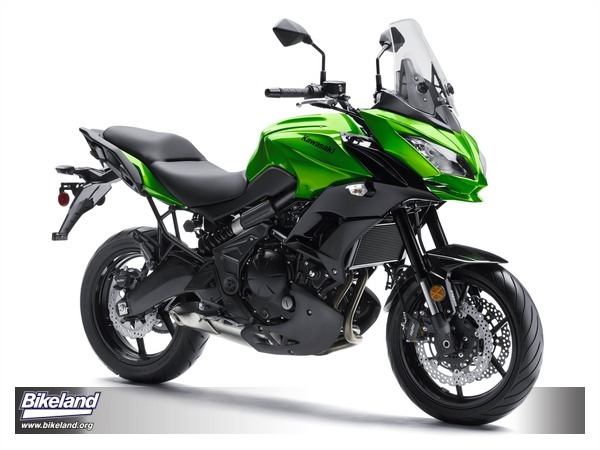 To add to its stunning new looks, the 2015 Kawasaki Versys 650 ABS is available in either Candy Lime Green or Pearl Stardust White to emphasize the sharp new lines. The dependable fuel-injected 649cc, parallel twin engine remains the best choice for this light and nimble street motorcycle with its lively performance and smooth acceleration. Derived from the Ninja® 650 motorcycle but tuned for greater torque, the engine inspires confidence for daily commuters and provides fun on weekend trips. The torquey twin delivers a deep ribbon of power in the low- and mid-range of the powerband, while also pulling vigorously to the top of the rev range. For 2015, the engine receives a new one-piece exhaust that boosts high-RPM power, which is matched by ECU changes that have also optimized fuel economy. When combined with a larger 5.5-gallon fuel tank, the fun-to-ride 2015 Kawasaki Versys 650 ABS can now enjoy extended periods between fill-ups. Adding to the versatility of the motorcycle is its proven six-speed transmission that seamlessly shifts between the gears, making maneuvering even easier. Long-travel, high-tech suspension coupled with the revised riding position is critical to the multi-role mission of the 2015 Kawasaki Versys 650 ABS. Combine these enhancements with the updated frame and you have one of the most versatile bikes in Kawasaki’s line-up. In the front, the all-new, adjustable Showa fork is utilized to increase rider confidence and comfort in all situations. It splits the damping and spring functions into separate fork tubes, giving the rider adjustability while also saving weight. New longer outer fork tubes help to improve rigidity and provide the ultimate combination of light handling and supreme comfort. At the rear, a new KYB shock allows riders to quickly make preload adjustments via the new remote-mounted adjuster. This can compensate for cargo or passenger weight or be tuned to the rider’s preference. The crisp, linear ABS brake system is revised and included as standard equipment for 2015. The brakes incorporate several updates including new Nissin block-style calipers, new brake pad material, new master cylinders and a larger rear disc to help enhance overall braking power. Completing the upgrade is a new, easy-to-read instrument cluster that features a revised fuel gauge, maximum range indicator and ECO Economical Riding Indicator that shows the rider when maximum efficiency is being achieved. With all these revisions, a great motorcycle is now epic. 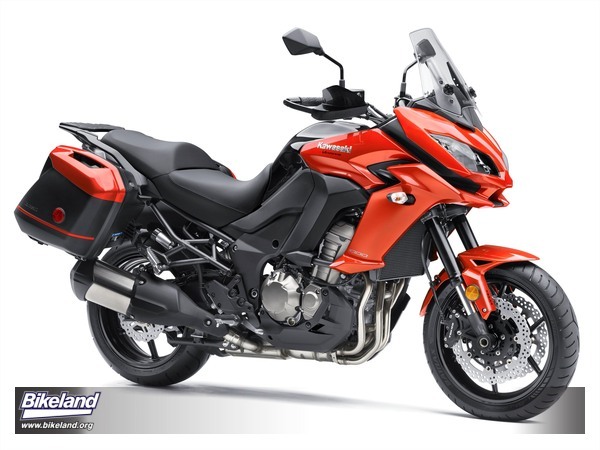 The 2015 Kawasaki Versys 650 ABS is a highly versatile motorcycle that is equally at home on the commuter run, cruising the freeway or on your favorite back road. It’s all about having fun, enjoying life and experiencing as many fun roads as you can. This is what the dependable, comfortable, reliable and fun-to-ride 2015 Kawasaki Versys 650 ABS allows you to do with ease. The 2015 Versys 650 will be available in two models. There is the fully equipped ABS model, and then the new LT model, which has the same specification and will be supplied with standard KQR (Kawasaki Quick Release) 28-liter Hard Saddlebags and Hand Guards. This equipment will add even greater flexibility to an already accomplished motorcycle. The saddlebags, for example, will be invaluable for both daily commuting and to make it more practical for weekend escapes. Furthermore, the Kawasaki Quick Release system makes it very easy for the rider to remove and mount the bags in a matter of seconds. The Hand Guards will further add to its appeal, bring welcome protection from the elements, increasing the long-distance comfort of the Kawasaki Versys 650 motorcycle. The Kawasaki Genuine Accessories program is available at authorized Kawasaki dealers. The range of options includes KQR™ (Kawasaki Quick Release) 28-liter Hard Saddlebags with the Kawasaki One Key system, as well as a new KQR 47-liter Top Case (with the same One Key system), which can accommodate two full-face helmets and can be used alone or with saddlebags. There is also an optional LED Light Bar, a 12v DC Outlet to power electronics, Grip Heaters, a low Gel Seat, Tank Bag, Knee Pads, Frame Sliders, Windshield and a Gear Position Indicator, to name some of the items offered as Kawasaki Genuine Accessories. You asked for it, America, and here it is! By popular demand, Kawasaki introduces the 2015 Versys® 1000 LT to the USA. And to increase its appeal, this versatile euro touring motorcycle has received dramatic new styling that increases its functionality. While the styling and powerplant might be new, the Versys 1000 LT retains the characteristics that make the Versys 650 so popular. It still has the comfortable, upright riding position that allows you to stay on-board all day when touring, as well as long-travel suspension that helps ensure it can soak up the bumps on the road less traveled. Adjustable suspension means it can easily be set to carry a passenger and a full load in its standard-fit KQR™ Hard Saddlebags, or entertain on twisty back roads. And with its 1-liter engine, the 2015 Versys 1000 LT motorcycle is guaranteed to deliver plenty of fun. The 2015 Kawasaki Versys 1000 LT packs in all the great features of the immensely popular Versys 650 but with the power, smoothness and performance of a 1,043cc inline four-cylinder engine that is engineered to deliver plenty of torque but utter dependability. It is also crammed with features, such as the three-mode KTRC traction control, selectable engine Power Modes, ECO Economical Riding Indicator, ABS brakes and the Assist and Slipper Clutch. It is this combination of engine, technology, comfort, nimbleness, versatility and reliability that has made the model so popular in Europe and around the world, and now US riders can enjoy its tremendous street bike virtues as well. Kawasaki has built a motorcycle for people who have an adventurous spirit, who want to get out and explore the great country we live in. So while this versatile and reliable bike can easily cope with the daily grind, even making the commute more entertaining, the 2015 Kawasaki Versys 1000 LT is equally adept at traversing interstate highways, taking you and all the gear you need to the remote paved locations we all dream of. The 2015 Versys 1000 LT is focused on the ride, and it’s ideally engineered to do so. It starts with the upright seating position that gives you a great view of the road ahead and good leverage on the handlebar when the roads become more challenging. The rider sits with legs in a relaxed position on low footpegs, rather than the high-mounted pegs on a sportbike. This allows the rider to relax and ride longer without needing to continually stop and stretch like many sportbike riders. The 2015 Kawasaki Versys 1000 LT seat has been designed to taper at the front, making it easier to reach the ground. In the middle and rear sections, the seat is flat and wide to accommodate the rider and passenger, helping to ensure both are equally relaxed as the miles tick by. The oversized handlebar is rubber-mounted (as is the engine) to reduce rider fatigue. The handlebar has a tapering damper to absorb vibration and a flat damper to absorb fore and aft movement. The levers are adjustable in five positions to allow easy reach. Hand Guards with aluminum brackets and rugged composite covers come as standard equipment to offer protection from the elements. The main tachometer face has a black background for high visibility, and there is a trip reset button mounted on the handlebar to help touring riders measure distances, fuel range, etc. The passenger gets robust grab handles, which form part of the mounting system for the standard KQR™ (Kawasaki Quick Release) 28-liter Hard Saddlebags. These saddlebags incorporate Kawasaki’s convenient One Key system, allowing multiple bags to be locked with the ignition key. The same system will work with the optional Kawasaki Genuine Accessories KQR 47-liter Top Case, which is large enough to store two full-face helmets. And, like the saddlebags, it is color-matched to the Versys bodywork. The 1043cc in-line four-cylinder engine gives the 2015 Kawasaki Versys 1000 LT many advantages over its competition, not least of which are reliability, versatility and a huge fun factor. The smooth but powerful Kawasaki engine can provide exhilarating performance, yet will be utterly dependable when transporting the rider, passenger and luggage across state lines. For 2015, the engine includes 12-hole fuel injectors for finer atomization, resulting in optimized combustion and efficiency. It also gets a sporty exhaust, which is indicated by a brushed aluminum finish to the silencer and a black, die-cast aluminum end cap. The ECU programming allows crisp throttle response, good torque characteristics and a wide powerband to ensure fun at all speeds. The engine has Kawasaki’s rider-selected Power Modes, allowing the rider to choose full power output when wanting to enjoy the open road, or have the ability to reduce it to 75% with a passenger or if conditions dictate. Further rider aids include Assist and Slipper Clutch functions that are derived from Kawasaki’s sportbike heritage. Not only does this reduce the effort required on the clutch lever, but it also limits back-torque when downshifting. The alternator supplies 15.3 amps at 1100rpm, enabling the 2015 Versys 1000 LT to run accessories such as the Kawasaki Genuine Accessories Grip Heaters or a GPS device, even when the engine is idling. A significant contributor to the ride comfort of the 2015 Kawasaki Versys 1000 LT is its long-travel suspension, which soaks up the bumps and is firm enough to entertain you on a canyon ride. In fact, it is the nimble chassis on the Versys 1000 that has made it so popular, able to run rings around its bulkier competition. A great deal of effort went into helping to ensure the 2015 Versys 1000 LT is stable at all speeds, with long outer tubes on the 43mm inverted fork providing rigidity, while the geometry provides light steering that is nimble and precise. The remote preload adjuster for the horizontal back-link rear suspension is another vital tool for the rider, since it allows simple suspension changes to compensate for the load of a passenger and/or loaded saddlebags. The 2015 Kawasaki Versys 1000 LT has a robust, twin-spar, aluminum frame to help ensure the motorcycle responds precisely to the rider’s input. The rear subframe was designed specifically to create secure handholds for the passenger while also providing mounting points for the Kawasaki Quick Release Hard Saddlebags. There is also a rear luggage area that will accommodate the Kawasaki Genuine Accessories Top Case. This can be used in combination with the saddlebags and operates on the same One Key system for convenience. As another indication of the motorcycle’s practicality, Kawasaki fitted a center stand as standard equipment. It gives the rider a stable platform when parked with a full load, as well as allowing easy maintenance. ABS brakes, 310mm front rotors and four-piston calipers are fitted as standard equipment, enhancing the motorcycle’s all-weather ability and increasing rider confidence in slippery conditions. 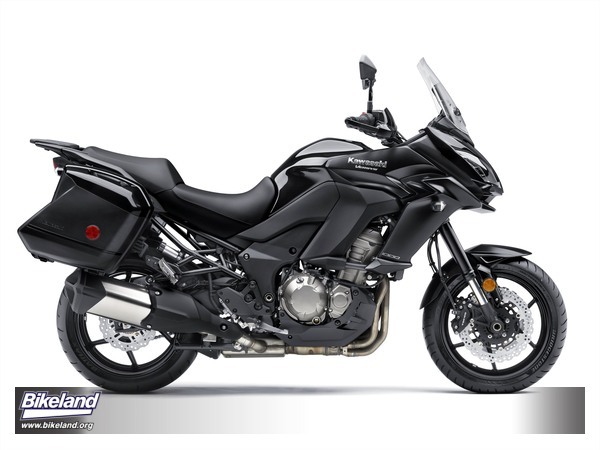 Fitted with sporty 17” wheels and Bridgestone Battlax Sport Touring T30 tires, the 2015 Kawasaki Versys 1000 LT is fully equipped for its role as a commuter bike, tourer and back-road entertainment. There are several electronic assistants derived from Kawasaki’s sportbike programs that are designed to help the rider when certain conditions arise. The Power Mode feature gives the rider the opportunity to reduce the engine output to suit the prevailing conditions. There is also a three-mode Kawasaki Traction Control (KTRC), which can be adjusted to suit the road surface. The three modes cover a range of riding conditions, offering either enhanced sport riding performance or the peace of mind to negotiate slippery surfaces with confidence. Finally, there is an ECO Economical Riding Indicator that shows when the motorcycle is being ridden in an economical manner, helping to stretch out the distance between fuel stops. As if to celebrate its arrival in the USA, the 2015 Kawasaki Versys 1000 LT received a dramatic new look. Replacing the stacked headlights of the previous model is a front fairing design that places two narrow headlights horizontally, giving the Versys 1000 a more captivating look. As well as looking great, the styling brings tremendous function, with a horizontal chin spoiler below the headlights contributing downforce at higher speeds to enhance stability. There is also an air intake between the headlights to feed the four-cylinder engine as speed increases. Furthermore, Kawasaki designers incorporated channels on either side of the front fairing, between the upper and side sections, improving airflow and reducing its air resistance. Details like the mirrors have also been designed to reflect the overall styling theme, and the large windshield is easily adjusted, with up to 2.95” (75mm) of tool-less adjustment to reduce buffeting on taller riders. To reflect its dramatic styling, the 2015 Kawasaki Versys 1000 LT will be available in Candy Burnt Orange / Metallic Spark Black and Flat Ebony / Metallic Spark Black color options. While it is fitted with KQR 28-liter Hard Saddlebags and Hand Guards as standard equipment, the 2015 Versys 1000 LT also has a host of optional Kawasaki Genuine Accessories that can be fitted. These include items such as the KQR 47-liter Top Case, as well as an LED Light Bar, Grip Heaters, Helmet Lock, Radiator Guard, Frame and Front Axle Sliders and a Gear Position Indicator, which can be neatly integrated into the instrument cluster. Additionally, there are Saddlebag and Top Case Liners, a Backrest Pad, DC Power Outlet, GPS Mount, Tank and Knee Pads, Windshield, Gel Seat and U-Lock Bracket. The 2015 Vulcan® S is a unique motorcycle that could only be a Kawasaki. It combines the low silhouette of a Vulcan cruiser and mixes it with Kawasaki sportbike-derived power and handling, as well as a custom fit concept, designed to comfortably fit a wide range of riders. The result is a package that offers comfort, confidence and adjustability, which combine to provide a very special riding experience. The 2015 Vulcan S is the only motorcycle in its class with standard adjustable, forward-positioned footpegs, allowing a range of riders to get comfortable. It also has a low seat height, as well as optional seats and handlebar for the same reason. Furthermore, it boasts the lowest weight of any motorcycle in the category, and we all know what that means – easier to maneuver, quicker acceleration, easier to stop, quicker to turn and smooth suspension action. Another stand out element of the 2015 Vulcan S is its 649cc liquid-cooled parallel twin engine. Derived from the Kawasaki Ninja® 650 and tuned for more low- and mid-range torque, the engine is very smooth when pulling away from a traffic light and responsive when the rider wants to accelerate. This makes it suitable for novice riders, while its top-end power and nimble handling will keep more experienced riders entertained all day. There are many aspects that can influence the comfort and confidence of a motorcycle rider, and one of the most obvious is the fit. So, first and foremost, the 2015 Vulcan S has been designed to accommodate a wide range of riders. The 2015 Vulcan S has a slim chassis thanks to the narrow parallel twin engine, which has it engine cylinders positioned further forward than a conventional V-twin engine. The parallel twin configuration also enabled engineers to route the exhaust under the engine and away from the rider’s legs. A further benefit of the slim chassis is an increased lean angle when cornering. The 2015 Vulcan S suspension has been designed to absorb the bumps and give the rider feedback. When combined with the low seat height, adjustable footpegs and range of accessory options, the 2015 Vulcan S ABS has been designed to instill confidence and increase the overall riding enjoyment, making it a good choice for novice and experienced riders alike. Continuing with the tailored fit theme of the 2015 Vulcan S, both the clutch and brake levers are adjustable for easy reach to suit a range of hand sizes. The rider will also appreciate the Positive Neutral Finder, which makes it easier to find neutral when stopped. The liquid-cooled 649cc parallel twin engine is another important aspect of the 2015 Vulcan S. It brings many distinct advantages, which includes its Kawasaki sportbike DNA that enables superb flexibility at all engine speeds, a healthy power band and legendary dependability. It is also considerably smoother than the traditional V-twin engines used in most cruisers. For the 2015 Vulcan S, the engine has been engineered specifically to make it cruiser-friendly and to inspire confidence in new riders, while still being fun and agile for experienced riders. There has been specific tuning to the camshaft profiles, intake funnel length, throttle body spacer and air intake to provide exceptional low- and mid-range power delivery. The aim was to create an engine with user-friendly characteristics that ensure the motorcycle is easy to ride, with a smooth power delivery that is responsive to rider inputs at low speed. It also has enough grunt at higher RPM to keep it entertaining, being considerably more powerful than most cruisers, without becoming intimidating. Thanks to its use of Digital Fuel Injection (DFI®) to carefully meter the fuel used by the 649cc engine, the 2015 Vulcan S will sip fuel, providing more miles and smiles between fuel stops while also being kinder to your wallet. The motorcycle boasts a 3.7-gallon fuel tank to give plenty of range between stops. With its cruiser appeal, the 2015 Vulcan S is long and low, with a wheelbase designed for increased stability at typical highway cruising speeds. And Kawasaki brought its sportbike expertise to create the slim, lightweight chassis that has a low center of gravity and centralized mass for even greater stability as well as nimble handling. These benefits will be felt as soon as you maneuver it out of the garage or in a tight space, but will be most appreciated on a Sunday morning ride. The new perimeter frame adds to the unique styling of the 2015 Vulcan S and incorporates a rear subframe with slim backbone that eliminates seat rails. By keeping the motorcycle narrow, it helps the rider’s feet reach the ground more easily. There is also a “D” section steel swingarm that provides both style and strength. The 2015 Vulcan S is fitted with stylish cast wheels that feature a five-spoke design with twin spokes. These measure 18” front, 17” rear and exemplify cruiser style. The wheels are fitted with modern, high-performance radial tires to provide responsive handling. As with any cruiser, style is very important, and the 2015 Vulcan S doesn’t disappoint. It incorporates elements such as the teardrop-shaped, 3.7-gallon fuel tank, inverted triangular headlight and black mirrors to match the black frame and exhaust muffler. The 2015 Vulcan S will be available in three distinctive colors, including Candy Lime Green as well as Pearl Crystal White and Flat Ebony. Kawasaki Genuine Accessories has developed a host of options to maximize the ownership experience of the 2015 Vulcan S. Owners can customize the fit, comfort and style of their motorcycle to meet their needs. Some of the standout items include Ergo-Fit™ seats and the Ergo-Fit reduced reach handlebar to tailor-fit the rider fit. Additionally, KQR™ (Kawasaki Quick Release) large and medium windshields, saddlebags and passenger backrest options allow for tool-less installation and removal of these classic cruiser accessories. Kawasaki Genuine Accessories will have more than 25 parts available for purchase at your Kawasaki dealerships in early 2015. 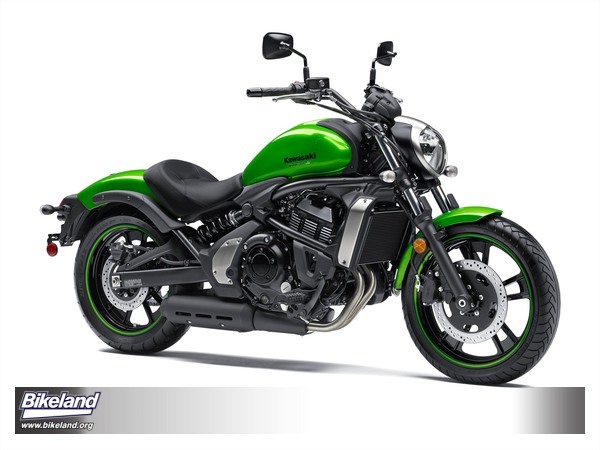 With its affordable purchase price, low running costs and easy parking, the 2015 Kawasaki Vulcan S is the perfect motorcycle for any rider to get across the city to meet friends. And while it has plenty of practical uses, the 2015 Vulcan S is fun, above anything else. It allows you to drop everything at a moment’s notice and take-off with a smile. So whether you’re a new rider looking to buy a first motorcycle, or an experienced rider looking to rekindle the reason you started riding in the first place, the 2015 Vulcan S is the perfect reason to visit your local Kawasaki dealer.